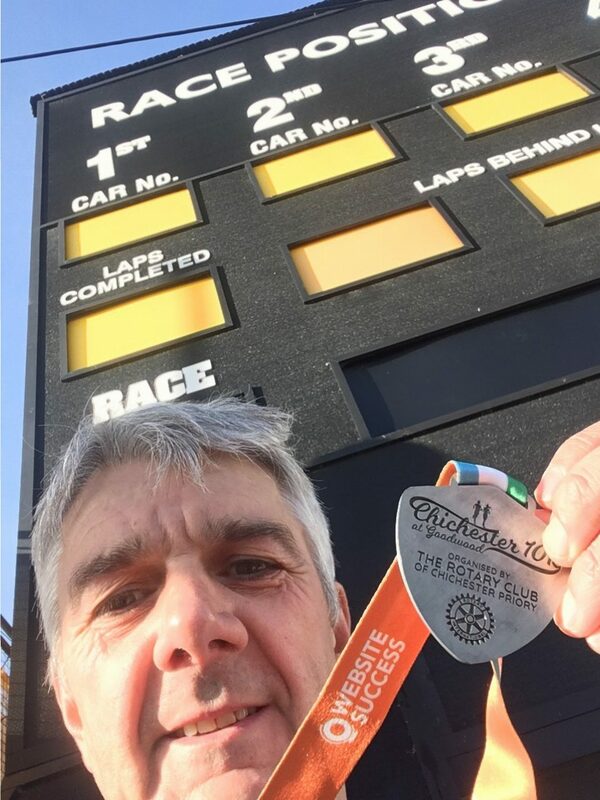 Brian earned his international call-up by finishing third MV55 in the fiercely-competitive Chichester Priory 10k in a new personal best time of 36 minutes 39 seconds. 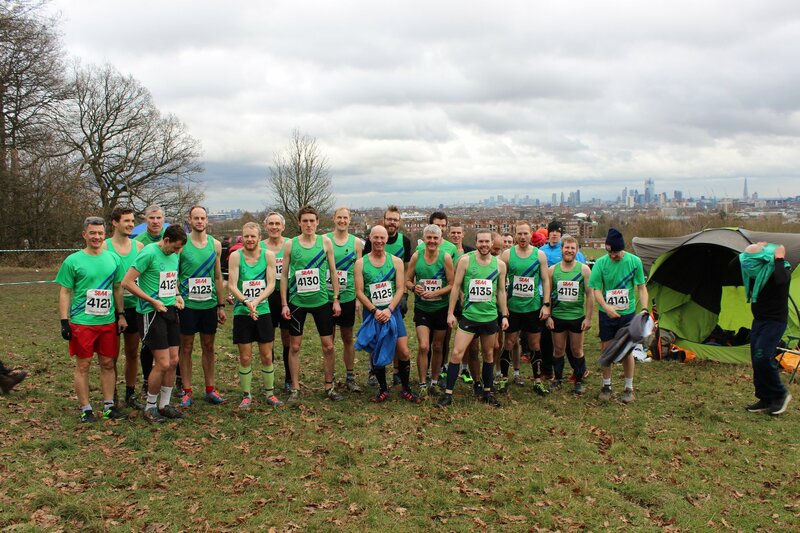 Produced strong runs for Roadrunners’ Hampshire League and Thames Valley XC League teams and at the South of England AA Championships on the fearsome Parliament Hill course. Now he can look forward to representing the England Age Group Masters team at the Great Birmingham 10k on May 26th. Brian and his Masters team-mates will line up at the front just behind the international elites in a race which usually attracts live television coverage. “It all started back in December when I ran every day for at least three miles,” he said. “That was in an event called Marcothon, a Facebook group that encourages runners to do three miles or 25 minutes every day for the month. 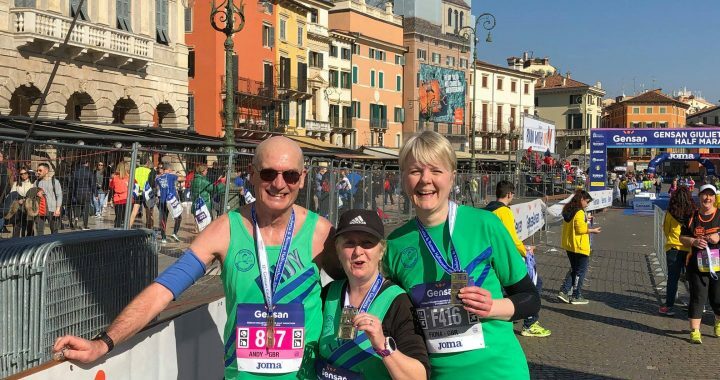 “Towards the end of the month I entered a marathon organised by Saturn Running and thought I’d completely fail given the extra mileage and tired legs. On the contrary I found that my endurance got me second place in a time that I had targeted with a few minutes to spare. “That really increased my confidence for the Gutbuster, at which I also gave everything and found that I could still have a good finish. “My main focus was to win my age category at the Woodcote 10k. 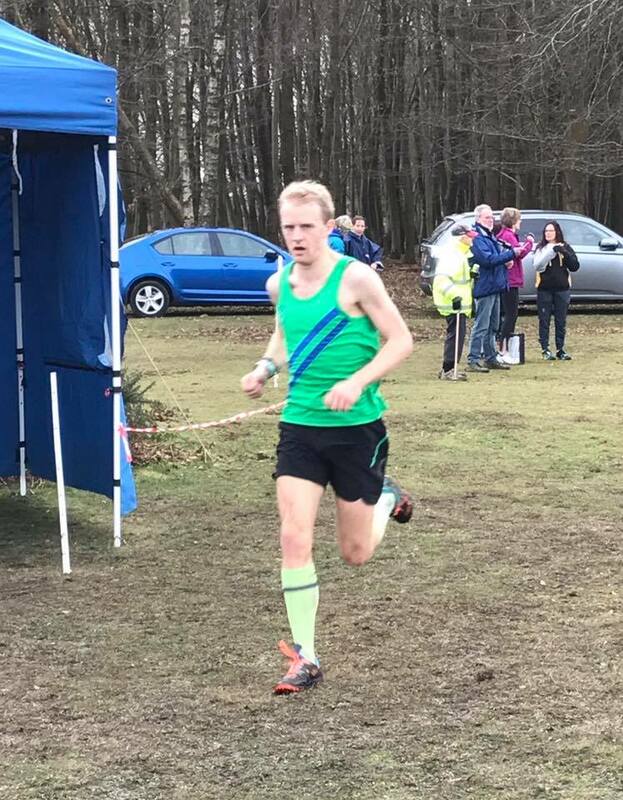 I managed to do the first downhill 5k in under 18 minutes and held on up the climb to win in a course PB of 38:24. But then he looked up last year’s results at Chichester, where the third-placed MV55 ran 35:57, and said: “My heart sank. 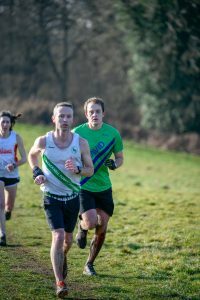 Even if I ran my track 5k PB of 18.25 twice that would still leave short by quite a margin. 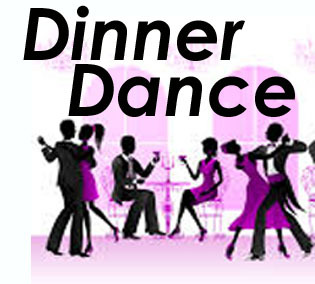 “But I entered anyway knowing I had nothing to lose and that the experience would do me good. “Sandy Sheppard gave me a lot of encouragement, as did the club captains Phil Reay and Sam Whalley. I knew I was capable of running faster but I also knew I had to beat myself mentally as that’s where I fail in races. Race day didn’t start well. After a late night at the dinner-dance he set his alarm for 6.15am, only to wake at 4.45am. “I suppose that’s quite normal for a postman,” he said, “but unhelpful before a race when sleep is important.” However, his customary double-strength coffee set him up well for the day. “I left early because the roads were frozen,” he said. “When I started out my car temperature gauge said minus five. By the time I got to Odiham it had gone down to minus 11. 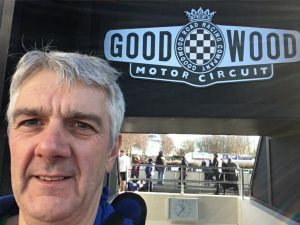 Fortunately when I arrived at Goodwood it had gone up to minus one. Cold, but not uncomfortably so. 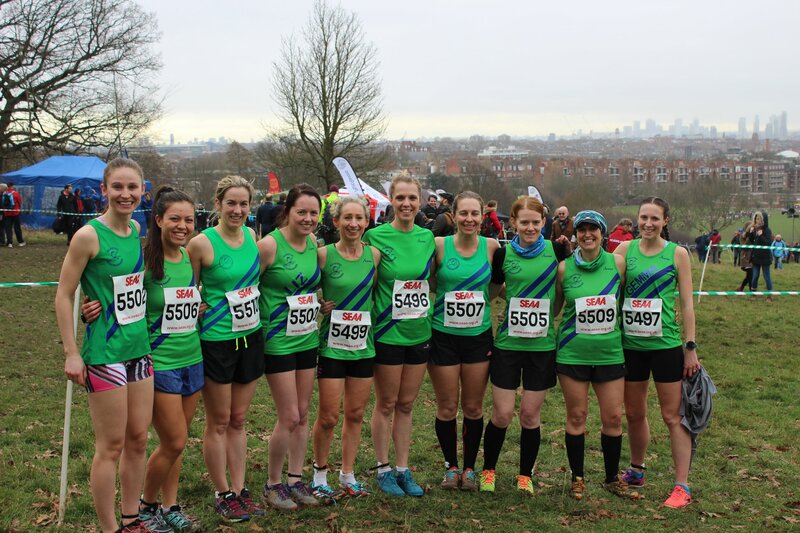 “Looking at the other runners in my pen (35-45 minutes) I could tell it was going to be fast-paced. They were nearly all Harriers or AC runners. “There is a danger of setting off too quickly in that company, what with the adrenaline and atmosphere, and I did exactly that. 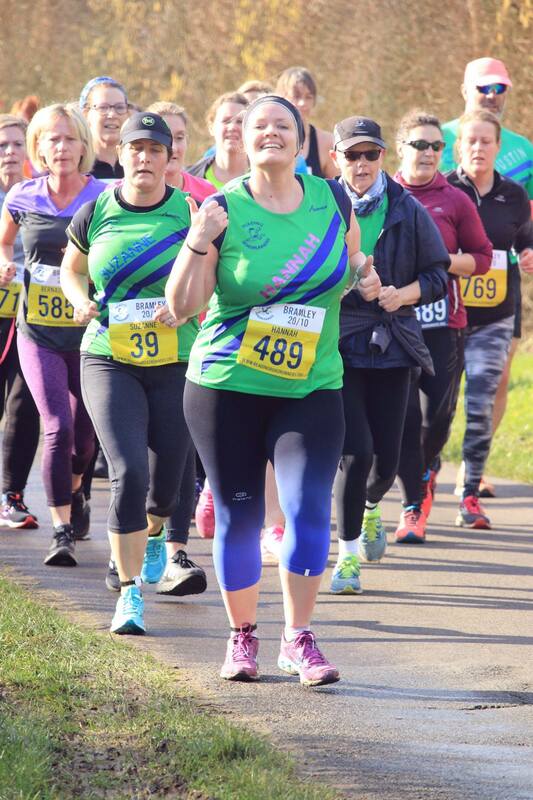 “My target pace was six-minute miles for the first half and then to see what I had left. But I shot off at the gun and did 5:37 for the first mile. 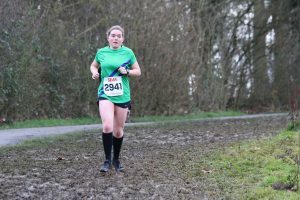 “It was slightly downhill so I forgave myself and tried to slow it down but still did 5:49 for the second mile. “That actually felt comfortable, so I kept that pace and did the next mile in 5:51. But it was slightly uphill and took a lot out of me. Looking at my watch at the 5k point, I realised I smashed my PB for that distance with 17:58. “The first 6k of the course is on mildly undulating roads and the last 4k is on the Goodwood motor racing circuit, with the end, fittingly enough, being on the Finishing Straight. On entering the track I’d developed a stitch and was worried that I was going to start being overtaken. “I finished my fourth mile in 5:58 but held my position. The next mile was painful. I had slowed to 6:02 with a chasing pack closing me down, so it was time to put Phil’s words at the dance into action. 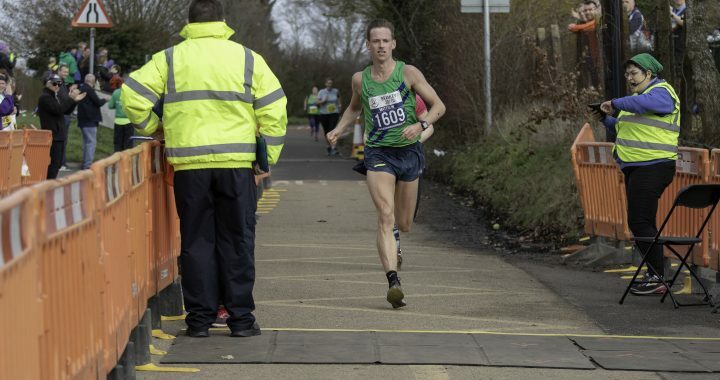 “I managed to get back to 5:56 for the last mile and pushed with everything I had left for the rest of the race at 5:32 pace to finish in 36:39, a PB by one minute and 19 seconds. 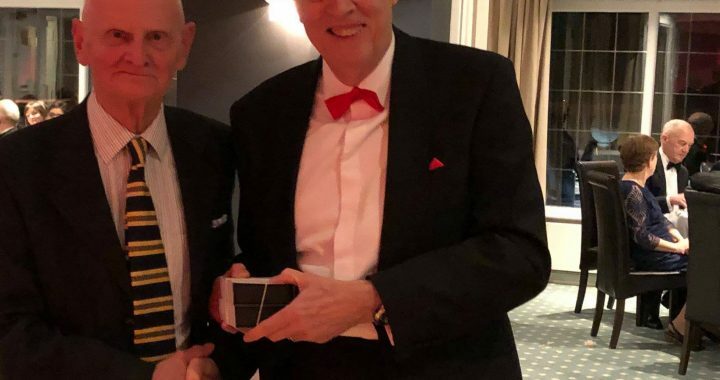 Quick to congratulate the Roadrunners’ latest international, captain Phil Reay said: “I first met Brian at an awards ceremony four years ago where he was collecting several gongs. He’s been stockpiling age category awards ever since. 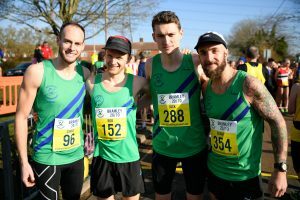 The first seven men home in the Chichester Priory 10k all broke 30 minutes, with William Mycroft, of the Enfield and Haringey club, taking the win in 29:32. 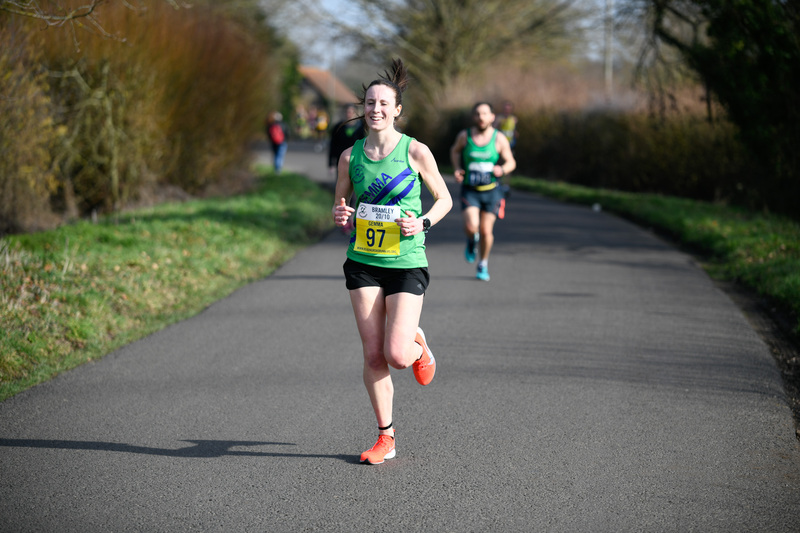 The women’s title went to former Olympian and regular Diamond League star Steph Twell in 33:17. 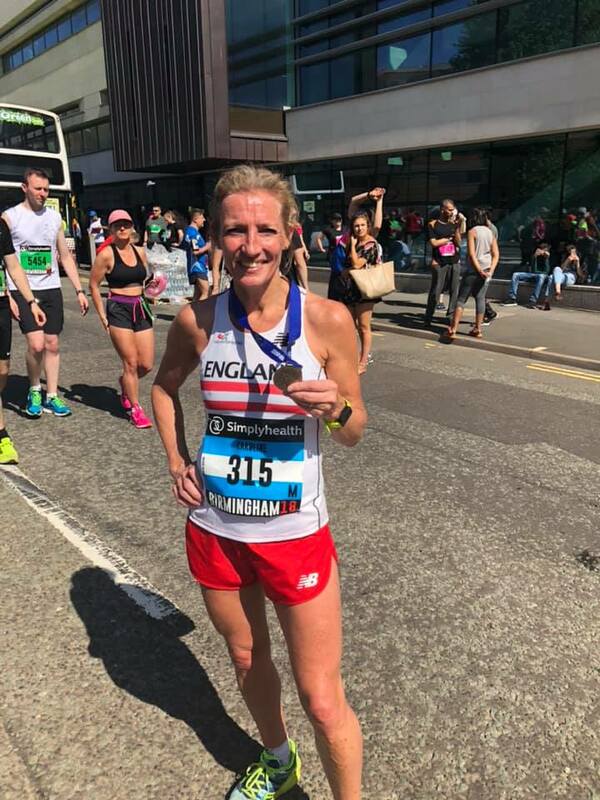 Brian will become the third Roadrunner to wear an England vest in the last year after Caroline Hoskins (above) represented her country at the 10k distance last May and Jane Davies (left) did so in the Chester Marathon in October. Several more Roadrunners will be chasing England Age Group Masters honours in the Fleet Half Marathon on March 17th. 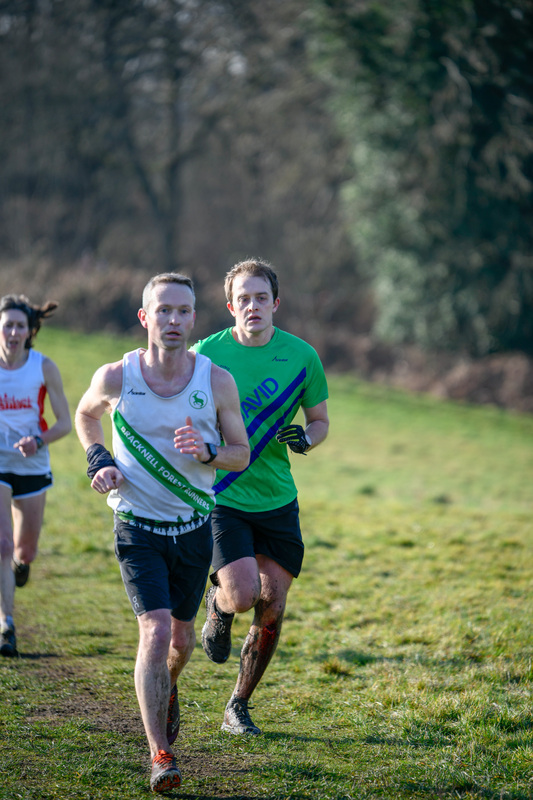 IT WAS a cold but sunny day that brought 64 green-vested Reading Roadrunners, and one guest, to Tadley for the penultimate race of the Thames Valley Cross Country League season… a pleasant improvement on the snow we had experienced there last year. We had a number of first timers — Brooke Johnson, David Clay, Samuel Alsford, Renée Whalley, Bryan Curtayne, Oliver Watts, Katherine Foley, Liz Johnson and, somehow, Lynda Haskins, who, for the first time ever, had found herself with a free Sunday. 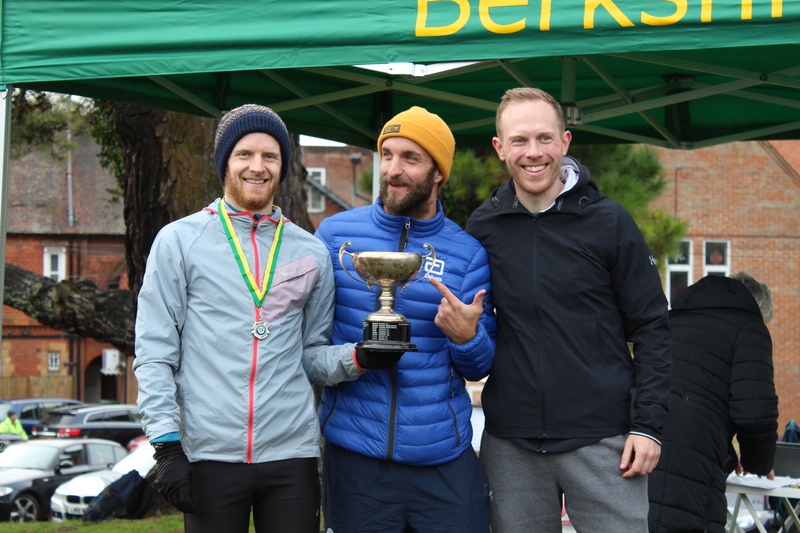 It was a dramatic debut by David, who bravely finished the race with blood pouring from his knee, an injury (right) which required seven stitches at the A&E. David hopes to make a full recovery in time to resume plenty of training for his big spring target, the Hamburg Marathon on April 28th. Back at the race, some green vests had been borrowed, and Tina Woffington was so excited to be participating in her first TVXC of the season that she had forgotten her £3 entry fee and had to have a whip-round. 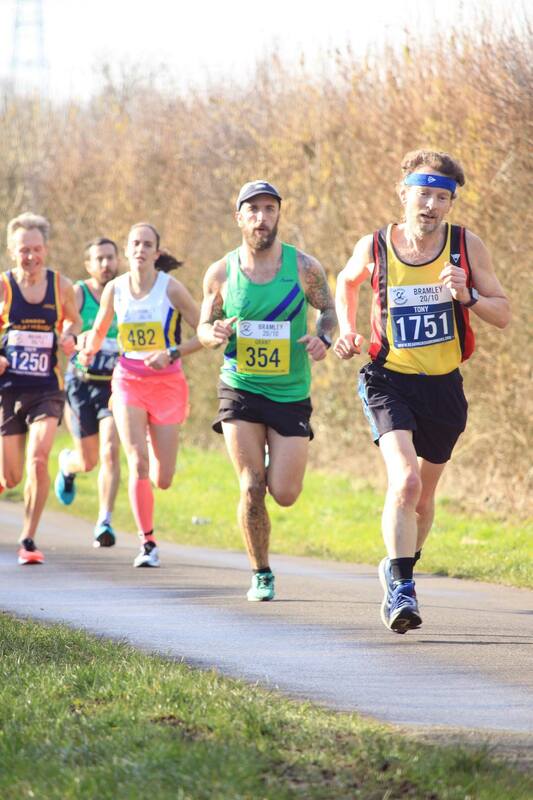 The Tadley course is not a great one for spectators, giving only really one spot close enough to the start/finish area that is wide enough for people to congregate, and even that is a hilly trek. Still it was nice to hear the cheers of our supporters, especially on that tough second lap. 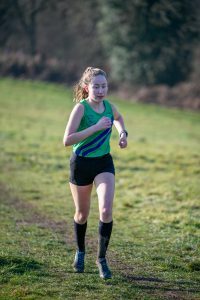 The lack of mud, due to the recent dry weather, and the resurfacing of the usually ankle-deep bridleway, did not seem to make the course less energy-sapping, and XC spikes were a definite advantage on the hills. At least it is one of the shorter courses. Team results are still being processed, but we can delight in the fact that both the first man and first woman were in green — whoop! 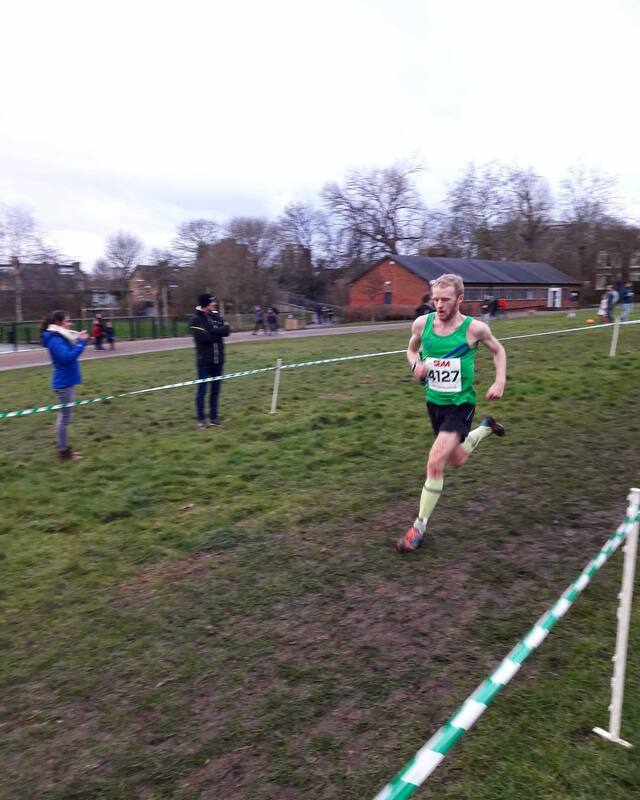 Rob Corney is used to winning races, and was wondering who he could be running with; it can be pretty lonely out at the front, apparently. Gemma Buley played down her first TVXC win by saying that some of her usual competitors weren’t there. Smiley photographic evidence would also suggest that Gemma just had a great run. 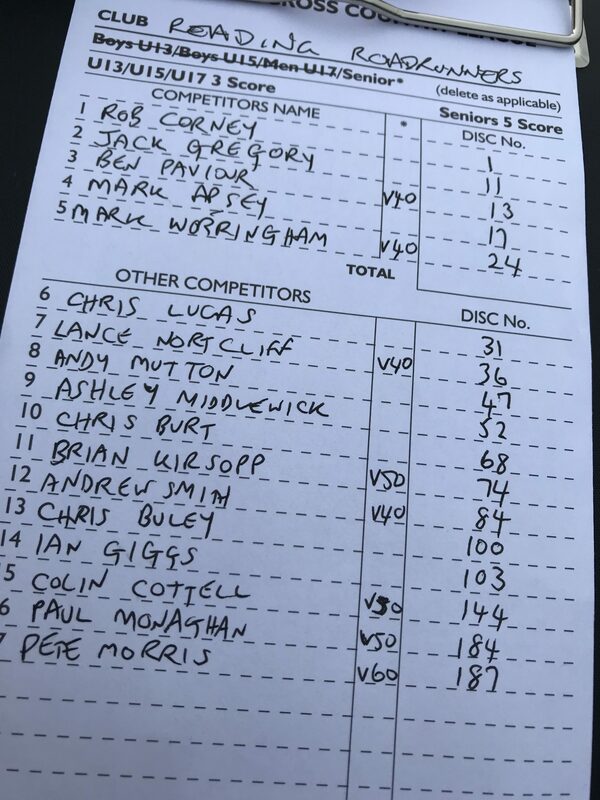 Scoring for the men, then, were Rob, Mark Apsey, Brian Kirsopp (vet), Chris Burt, Robin Lomax, and Richard Usher (vet). Mark claimed he had not raced well, but fifth place is not so shabby. I think it’s time we all started having whatever Brian is having for breakfast; he has to be one of our most in-form runners at the moment. The women’s scoring team was made up of Gemma, second-claimer Renée Whalley, and regular vet scorers Mary Janssen and Lesley Whiley. 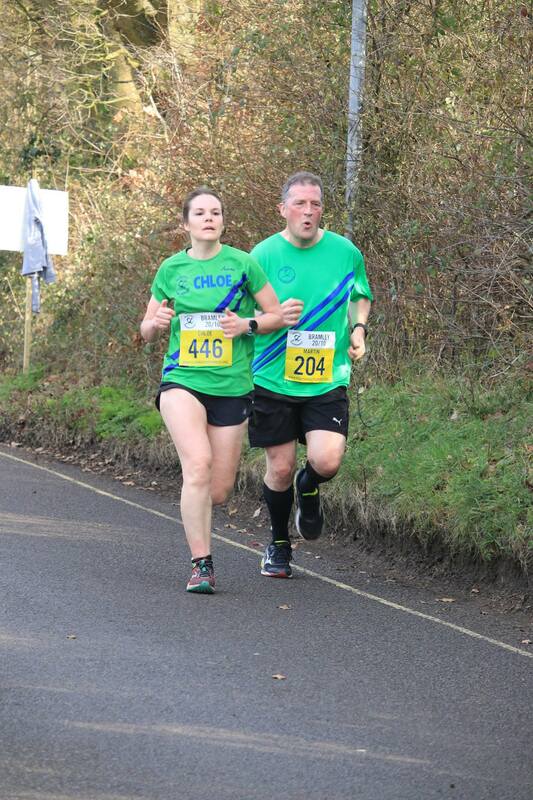 Sixteen-year-old Renée (left), being used to running the 4-5k races of the Hampshire League and other championship races, was pleased to find herself well in the mix with the senior men, despite the longer distance of 5.3 miles. TWENTY-FIVE Reading Roadrunners were entered into the Berkshire Championships and although this is a team selection race for the inter-counties XC championship, held in Loughborough in March, it is also a good opportunity to try to pick up some team prizes. St Andrew’s School in Pangbourne was the venue. This is not one which is familiar to me, so I was unable to advise on whether it would be grassy, hilly or otherwise. 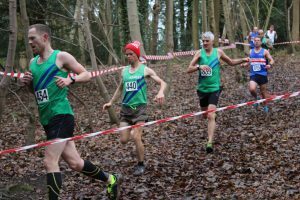 However, the organisers suggested that trail shoes might have been preferable to spikes, given certain stretches of the course. 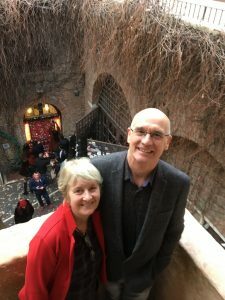 It was, it turned out, a course of two halves: flat playing fields which led to woodland, with twists, turns, tree roots and plenty of undulations. First up, for a change, were the senior and vet men. The under 20 men were also in this race, but were able to duck out after 9k (3.5 laps), while the more grown-up men continued for a total of 4.5 laps, and a total distance of 12k. 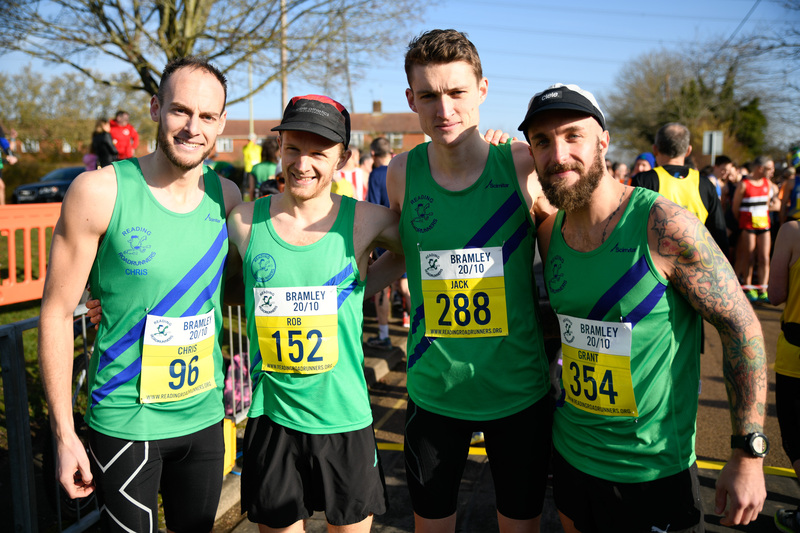 For the past six years, this race had been won by the same person — Alex Tovey from Birchfield Harriers — and this year was to be no different. 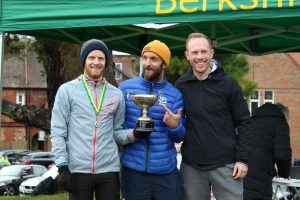 He did, however, have Rob Corney on his heels this year, and they seemed to switch places throughout the race, with Rob eventually a fantastic second, a place up on his position last year. I was sure to give the Reading AC man who shook hands with Rob at the prize-giving a hard stare; I do hope Rob decides to stay with us (we do have brownies, after all), and that the incoming chairperson will seek to offer our high-performing athletes the expert coaching and support they make be seeking elsewhere. 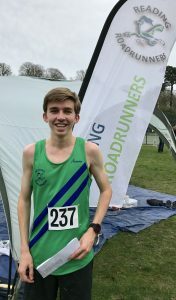 I’ll step down from my soapbox to say that the next Roadrunner to finish was Mark Apsey, who, having been selected for Berkshire as a reserve last year, was determined to earn an automatic qualifying position this time, and he did just that, with a really strong run, and fifth place. 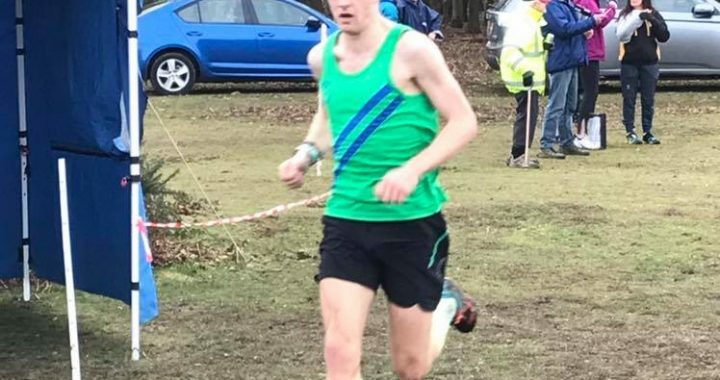 Jack Gregory was next in, followed by Mark Worringham, who managed to equal his second vet placing from last year, this time beaten by Newbury’s James Craggs, who also took individual gold at the BBO XC champs in November. 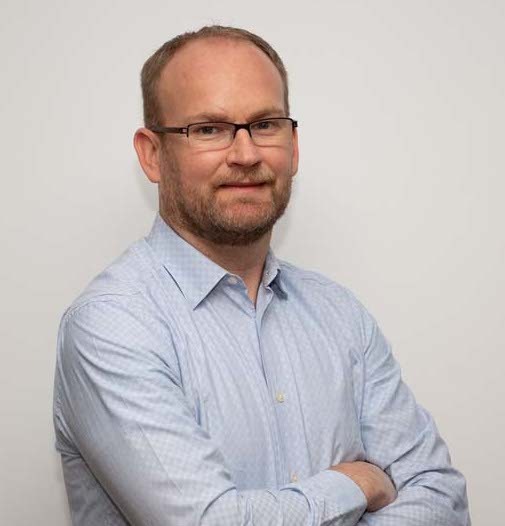 These championships are ones where a male is considered to be a veteran at the age of 35, rather than 40, and consequently most of our male vets find themselves in competition with different people. Completing the seniors’ scoring team of six were Chris Lucas, David McCoy and Ashley Middlewick. 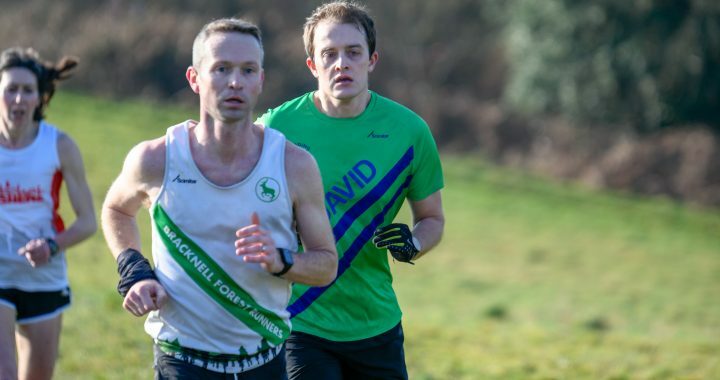 Ashley had had us all worried when he volunteered to marshal at Woodley junior parkrun before the race. A great thing to do, by the way, but on race day? 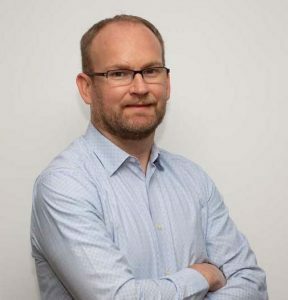 We needn’t have worried, as he managed to arrive in good time, even if he was still standing around in tracksuit bottoms and coat four minutes before the start. Talk about making me tense. 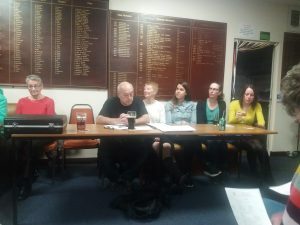 Ashley, and the others, all ran excellently, and the seniors team was awarded the overall trophy, for the first time since the 2009/10 season, with 58 points to Newbury’s 83. Chris Burt was next to finish, having had a brilliant run. We would have also expected Lance Nortcliff to be in the mix by this point, but on lap two he had twisted his ankle in the woods, and was unable to finish the race. It was Ben Whalley, then, who finished as second vet scorer for the team, much to his own surprise. In fact, having flown home from a two-week work trip to the USA four days before the race, and nursing an iffy knee, Ben was far from confident in his ability. 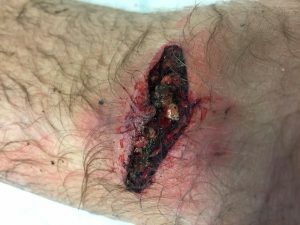 This was worsened by a frantic search for his wallet on the morning of the race, and stepping in something revolting. 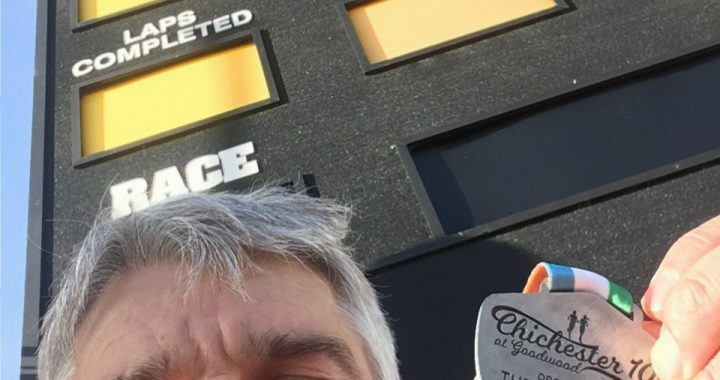 A warm-up jog with chef Apsey was ordered, and a chat about the best way to cook a Christmas goose seemed to get his head in the right place. 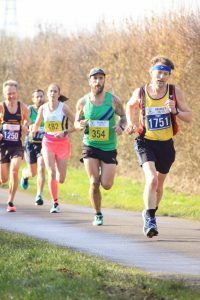 Andy Blenkinsop was next Roadrunner vet to finish, followed by Brian Kirsopp, this year having entered in the correct age category (although thankfully they have changed the system and it is not possible to mistakenly select the incorrect one). 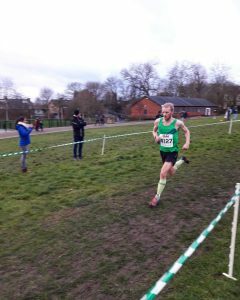 The vets team was therefore second, after Newbury AC. 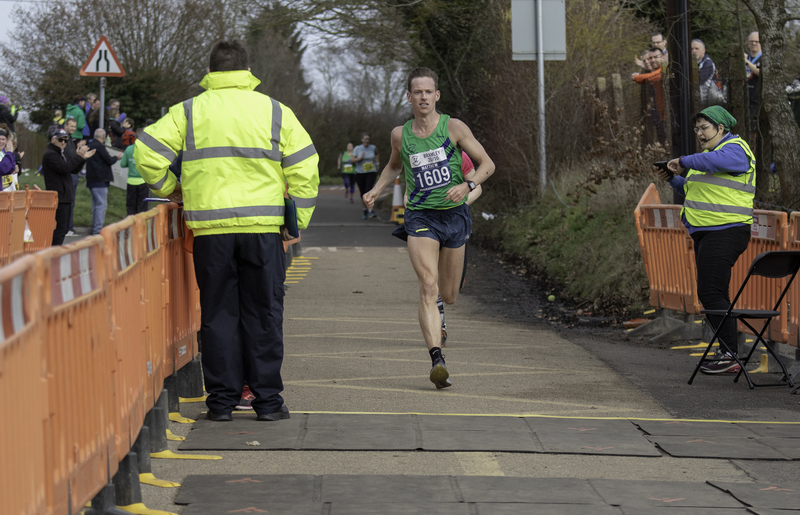 Pete Jewell, Grant Hopkins and Andrew Smith were not far behind, the latter struggling with a knee issue. Grant and fellow championship newcomer Chris Burt had been a little alarmed by the speed and competitiveness at the front end of the field, but nevertheless both managed to record 10k PBs during the race. 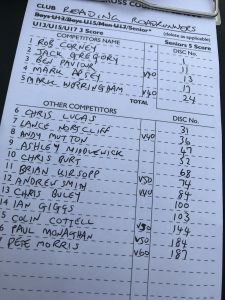 Tim Grant, David Caswell, Bryan Curtayne and Nick Adley were the remaining vets in the team, and the vets B team was fourth. What a great club this is, to be able to field two complete vet teams! 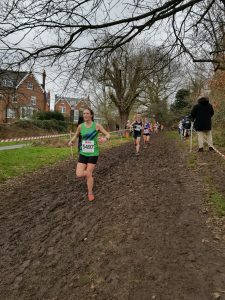 The women’s race followed, with an incredibly small field of only 12 seniors, 10 vets, and six under 20s, with the youngsters completing two full laps to the others’ three. 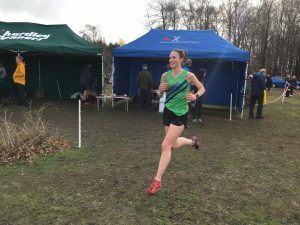 We had only entered one senior woman for this race, Chantal Percival, but unfortunately she injured her ankle the day before, and was unable to compete. Fingers crossed that her third place finish at the recent BBO championship will be enough to earn her a Berkshire vest. Our vet women, then, were our only medal hopes… no pressure! As Pete Jewell gave them the lowdown on the best places to run throughout the course, both for efficiency and injury avoidance (this is a real benefit of running separate male and female races) I did tell them that we needed four to score… again, no pressure! 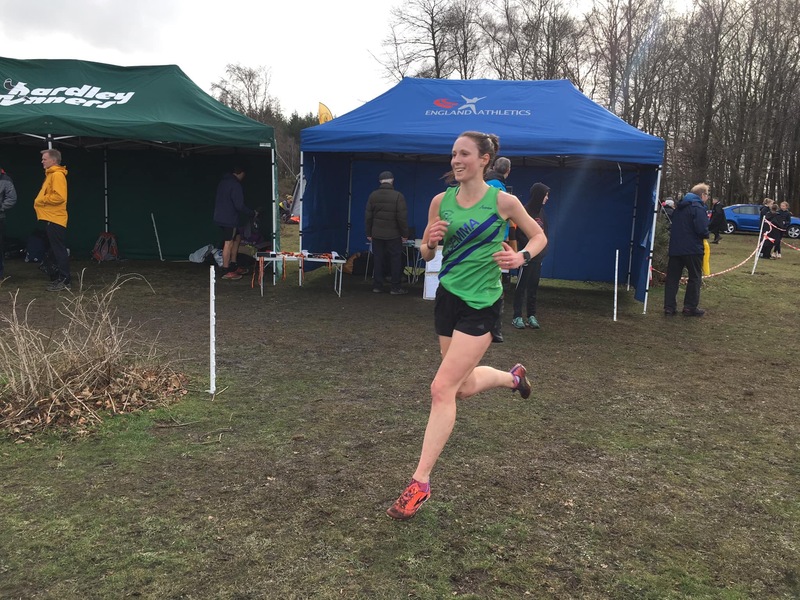 The race was won by Bracknell’s Amelia Quirk, who you might have seen on TV last week, representing Great Britain in the Euro cross country championships. You could say the standard was high, and we were missing some of our usual top performers, due to injury. First Roadrunner home, as expected, was Helen Pool, as fifth vet, with Nicole Rickett having a great run in seventh. Lesley Whiley ran her usual, strong, ‘start slowly and pick them off’ race, and was ninth, while Susan Knight tried to keep her in her sights, and was tenth. 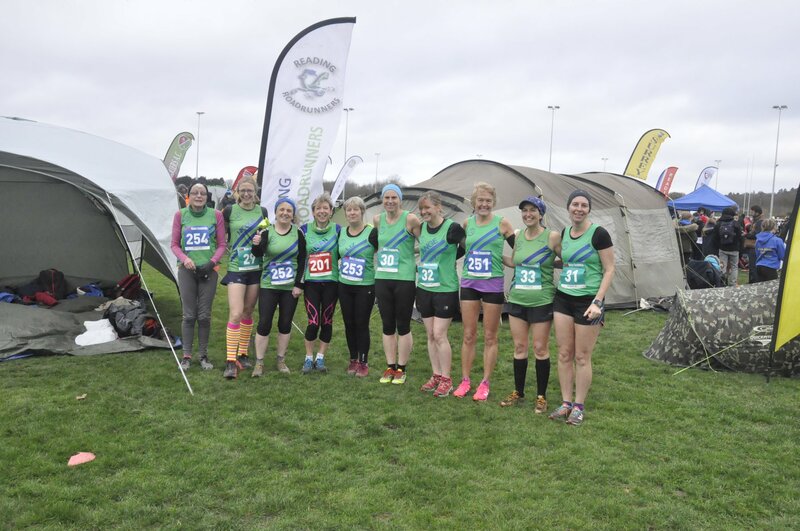 By my calculations (actual maths), the vet women’s team was second to Newbury’s first. When it came to the actual prize-giving, though, it was announced that there was only one complete team. 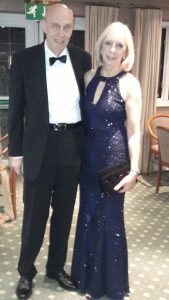 An inquiry found that Lesley was missing from the results, and a further investigation revealed that men’s captain Phil Reay had given her Chantal’s race number, and no one had noticed that it began with a 4 rather than an 8. Honestly, give a man a job! 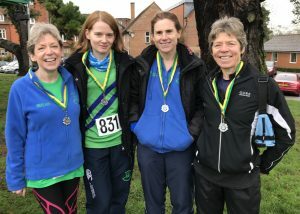 Fortunately (for Phil), the Berkshire Athletics people were in a very good mood, and it was all sorted, with the women receiving their silver medals, the same as last year. Great result! Normally this would be where my report ends, but on this occasion we also had an under 17 male running later in the day. 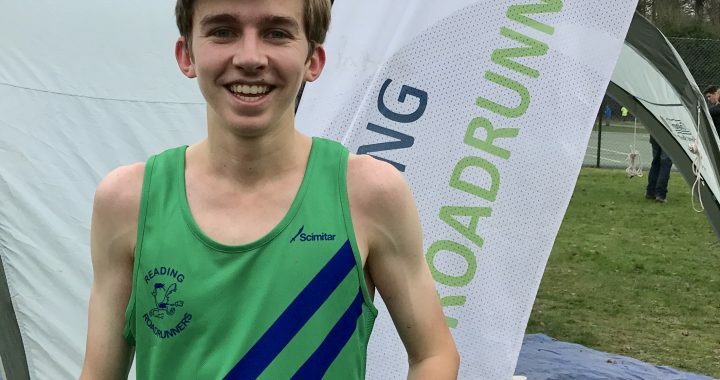 James Rennie wasn’t sure how he would do in the 5k race, knowing what a competitive field it was. However, he started off in around tenth place, and ran an extremely well-paced race, finishing an incredible fourth. 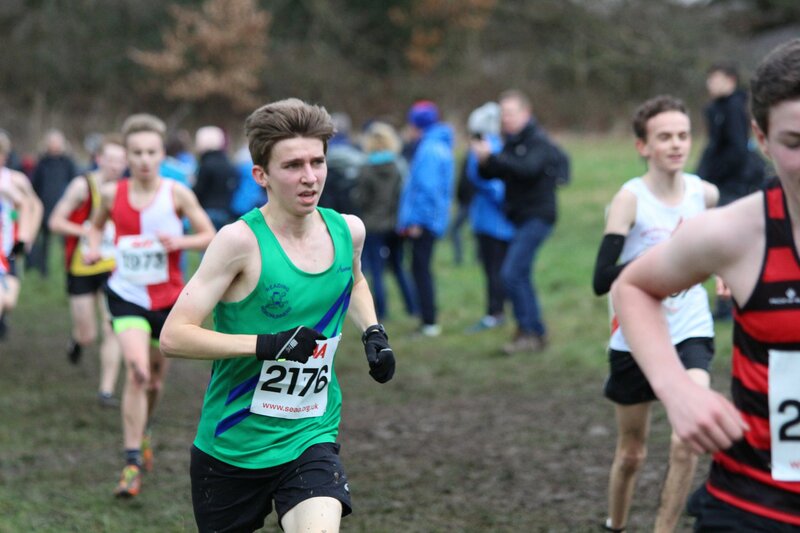 This earned James an automatic place in the inter-counties — well done! Conditions? Well it was raining a bit. But tough? 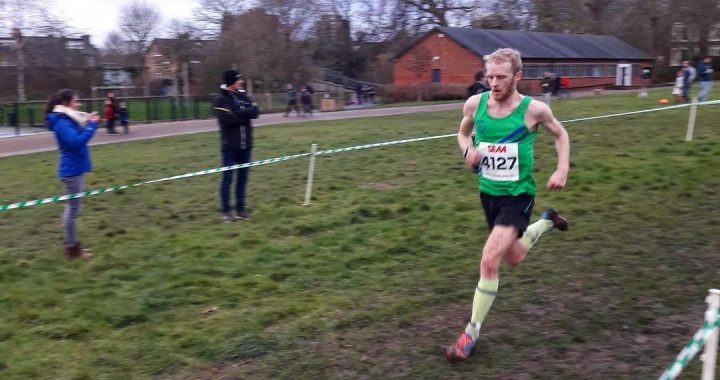 The young Norwegian would find more than a few twists and a couple of logs in Prospect Park or Parliament Hill, or even at Horspath in Oxford, venue once again for the SEAA Masters XC Championships. I bet he hadn’t had to erect and dismantle an event shelter in gale force winds either. (How many Reading Roadrunners does it take to put up a tent on a windy day? As many as you’ve got. This was seriously one of the hardest things I’d had to do all year). Anyway, there are some of us who love racing in these championships. There is something appealing about being in a race where everyone is over 40. The chance of getting lapped is lower, for one thing. For others, though, this is just one race too many in a busy competition calendar, and with December already busy for most people, we did not manage to field full teams in all of the age categories, which was a shame. 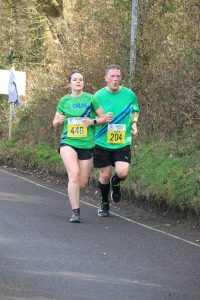 We were also missing a couple of runners on the day, with Sarah Dooley and Jim Kiddie having picked up injuries the previous week. Thank you, Sarah, for coming to support us anyway — so nice of you! As part of my recruitment campaign, I had billed this as one of the flattest courses we run. I did half-heartedly look for a course map when I arrived, but assumed it was probably unchanged. Oops! After we crossed the first field, we were shown right instead of left. Something was amiss — we were heading towards the hilly woods! 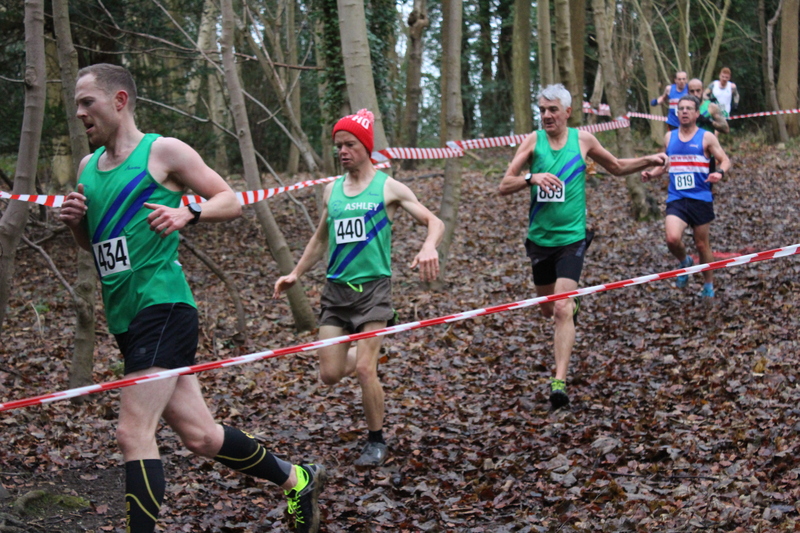 One and a half laps of the hilly woods, in fact; I felt bad for those running the race for the first time. 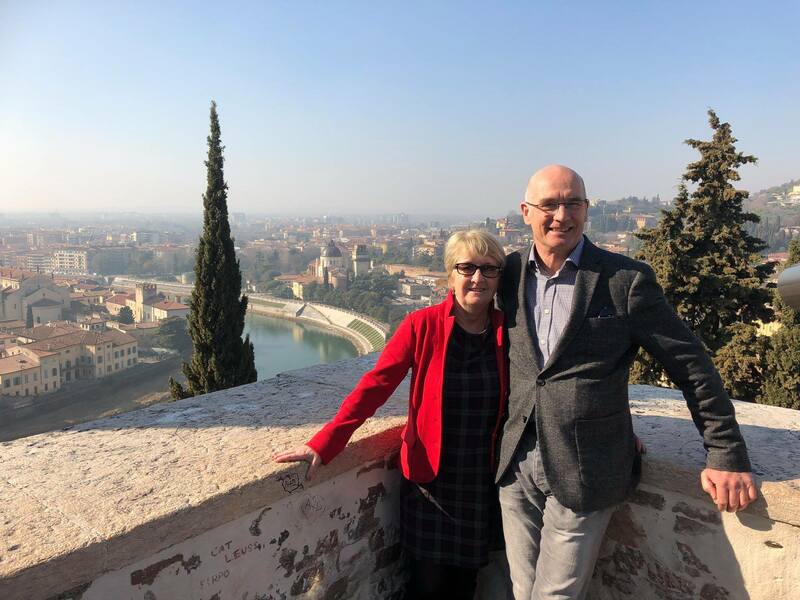 “This is a completely different course,” I said to Nicola Gillard as we climbed the first hill, so she would know I hadn’t deliberately misled her. We now knew something about the course that the men would run too, although they were to do an extra lap, with 10k to our 6k. On to the results, then. 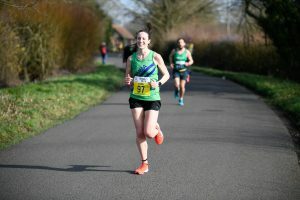 In this race, there are overall individual results, then individual results in both five-year and ten-year age categories, along with overall team results, and team results in each ten-year age category. Got all that? I usually report results in the order that the races occurred, but there was no bling to be had there, and we want a big finale. Suffice to say, there were 225 men in the race, and the scoring team of Peter Aked, Mark Andrew and Tim Grant was 25th. These were all over-50s runners though, and they fared better among the over-50s, being 18th team. Colin Cottell and David Fiddes, the latter having just recovered from a cold, completed the over 50s team. 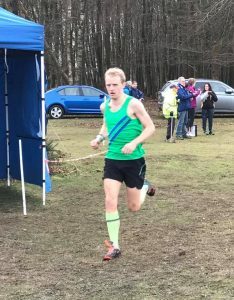 Bryan Curtayne was our only over-40 runner, although he seems to be missing from the results at the moment, while Alan Freer and Andy Atkinson had good runs for the over-60s, with Alan in 20th place, out of more than 50 over-60s runners. This is a championship for the whole of the south of England, don’t forget. Well done, everyone! It was the women who really shone this year, though. 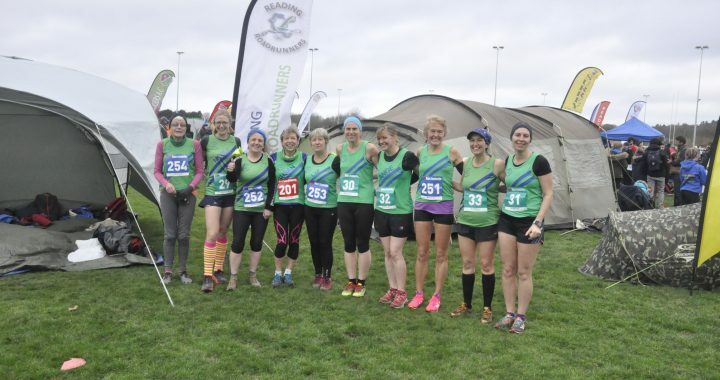 There were 125 in our race, with overall scorers Jane Davies, Helen Pool and Angela Burley bringing the scoring team home in seventh. 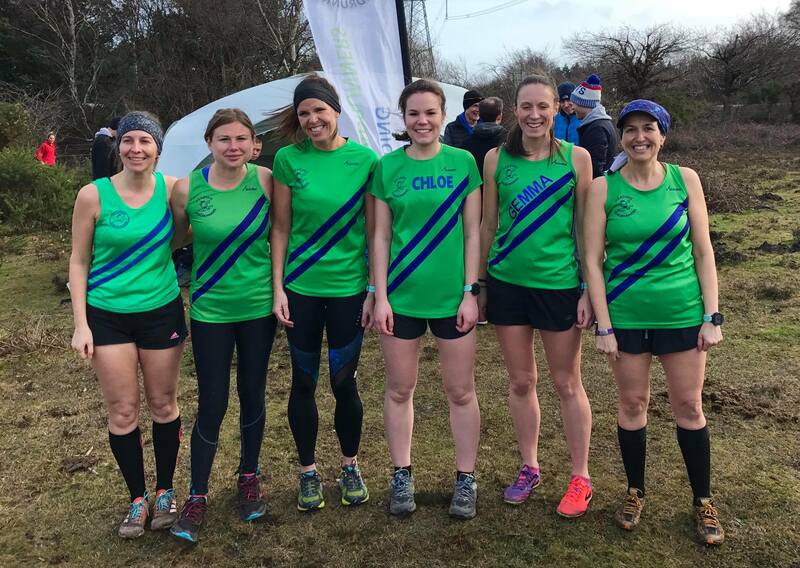 Two of these were over-40s, with Helen being 17th over-40 out of 49, but they needed one more to score for their over-40s team. That was me, and that team was sixth. 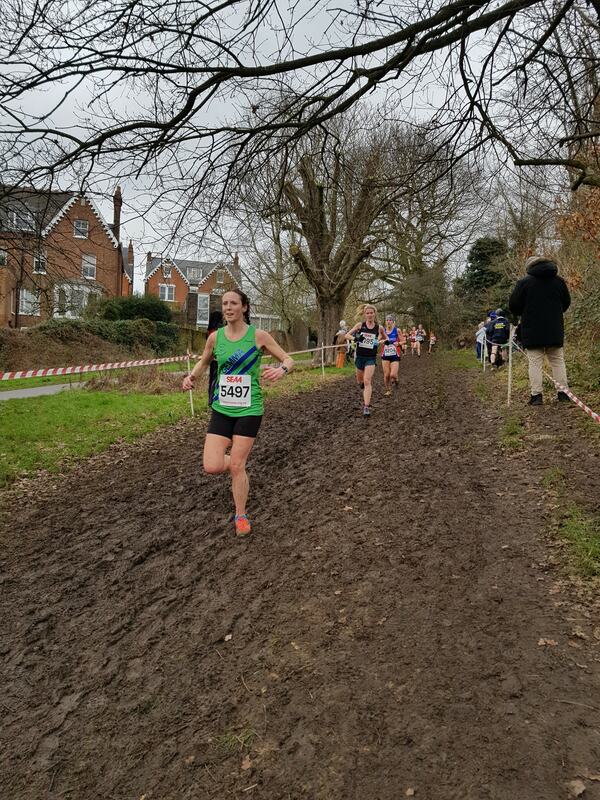 Nicola Gillard and Claire Seymour ran well, and completed the over-40s. 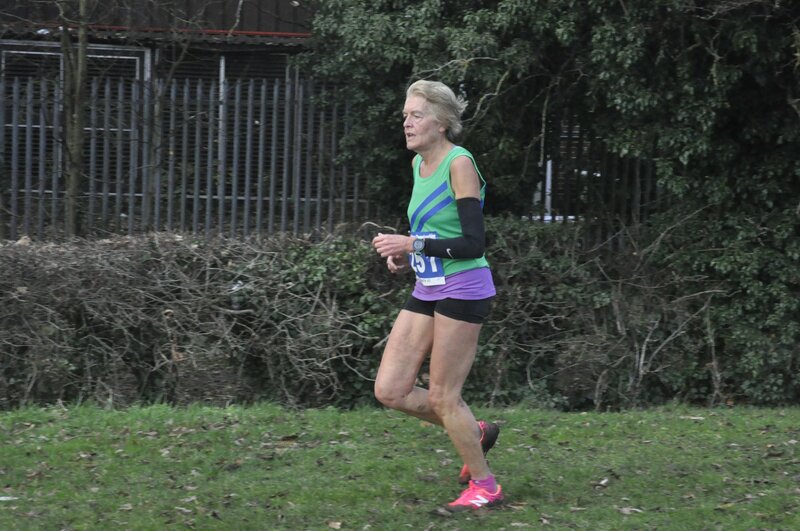 We only had one over 50s runner, Susan Knight — who is continuing her excellent form. 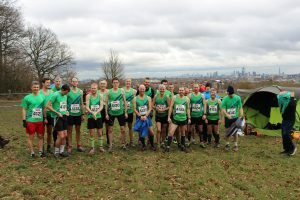 Well done to you all, and hope to see you in the mud again soon. I’ve saved the best — over-60s women — until last. 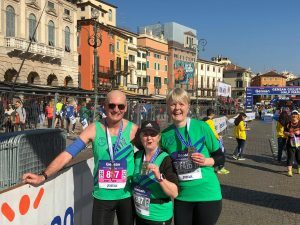 Dubbing themselves A Hare and Three Tortoises, the team was made up of the superfast Jane Davies, new marathoner Liz Atkinson, ultrarunner Kathy Tytler, and regular Cecilia Csemiczky, who has begun to feel a bit hard done by as an over-70 with no over-70s category to run in. 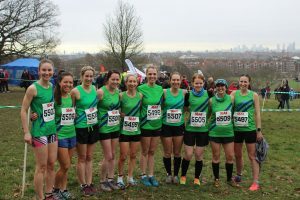 In recent years, however, the women in this age category have either picked up team medals, or almost picked them up, missing out by only a point or two. We knew then, that with the just-turned-60 Jane on board, their chance of a team prize was high. And we were right, as they collected the team bronze, a great result! 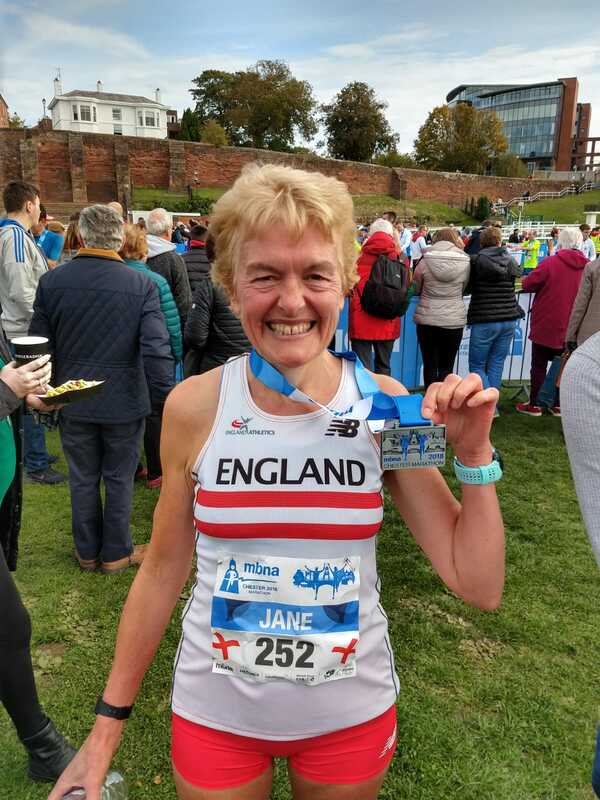 Even better though, and a surprise even to herself, Jane proved that she was the fastest over-60s female in the south, with an individual gold medal. 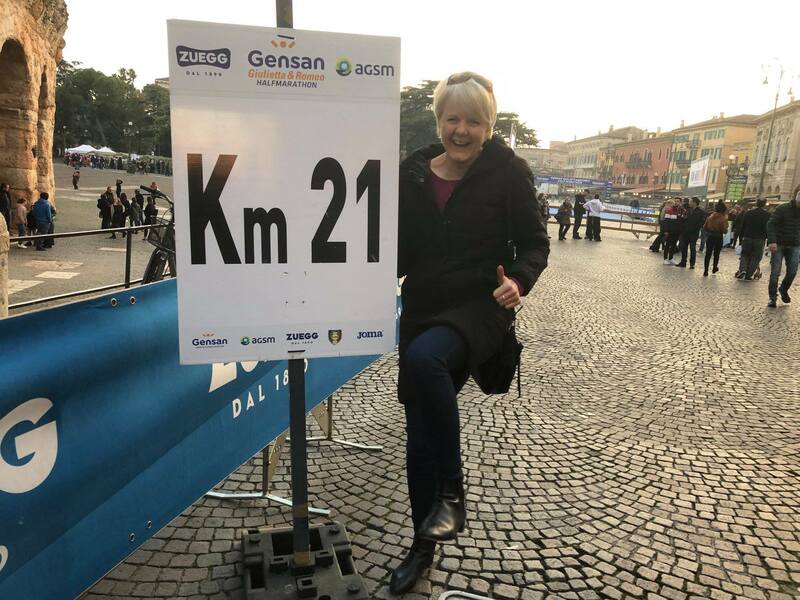 We have said it would be useful in these races to have numbers on our backs as well as fronts, and this is why — Jane was 27th overall, but obviously did not know the age categories of those ahead of her. As captain I could not be prouder of this amazing woman, and hope it is the first of many over-60s awards to come. She and the rest of the team are an inspiration to us all. Again, well done, and thank you for making time to run for the club.